A service of reconciliation will mark the 500th anniversary of one of the bloodiest battles between England and Scotland, it has been announced. 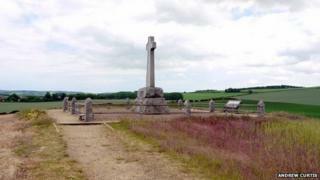 The Battle of Flodden took place in Northumberland, close to the Scottish border, on 9 September 1513. It resulted in the death of Scottish King James IV, and is considered by many to be a turning point in history. Communities from both sides of the border will take part in the service at Branxton on 10 September. There were an estimated 10,000 Scottish deaths, including the king and members of almost every noble family. About 5,000 English soldiers also lost their lives. The Earl of Surrey, commander of the English army, will be represented by his 21st Century descendant, the Duke of Norfolk, while the present-day Earl of Hume will represent his Scottish counterpart. James VI & I joined England, Scotland, Ireland and Wales in a personal Union under one monarch. He referred to England as "South Brittainne" and Scotland as "North Brittainne"
In 1606 the earliest version of the union flag was used on ships, the English St. George's cross over the Scottish saltire. The fallen of both sides will be remembered through a series of readings and hymns and the Northumbrian and Scottish pipes will be played. Clergy from the main Christian denominations will also be at the service. Rev Rob Kelsey, of Norham Church and the priest in charge of Branxton Church, said: "We are seeking to honour those who died on both sides of the conflict. "The battle has left a lasting legacy and especially so north of the border. "Part of the point of the service is to raise awareness as well as build bridges and work together towards a better future." Rev David Taverner of Coldstream Parish Church, added: "The aim is to mark the anniversary of a very important battle in an appropriate way, and in such a way that will be relevant to the 21st Century." Alistair Bowden, of the Flodden 1513 Ecomuseum project, said: "In the whirl of activities being organised to commemorate the 500th anniversary of the battle, it is vital that we don't lose sight of the human cost of Flodden." The battle took place when James IV, who was allied with France, launched an attack on England, in response to Henry VIII's invasion of France. Just 90 years later, the crowns of England and Scotland were united under James VI of Scotland who also became James I of England.